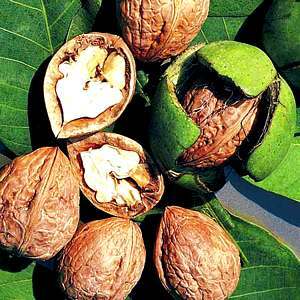 Have you heard about growing walnut trees as an investment? I’ve always been curious about it. I’ve even heard “experts” on CNBC say that it’s the best investment for your money in today’s low returns environment. He said that if you plant a $10 walnut tree, in 10 years you can sell it for $1000. Or something like that. I had to investigate that kind of claim. It turns out that you can make money by growing walnut trees, the Juglans nigra (black walnut) trees to be exact, to sell for their furniture-quality wood. However, it’s not as easy as just planting a tree in your back yard and waiting 10 years. 1. about 25 years old–you’re not going to move, right? That eliminates most homeowners unless they want to plant a grove in their front yard. If you have rural property that you can afford to cover in walnut trees, this could work for you. That excludes most of us. Well, it sounded like a nice idea. On the positive side, if you have a walnut tree you can enjoy “free” walnuts. They freeze well to allow you to use them throughout the year. The green cover of the nuts will rot & make an inky mush that can be used to stain furniture (also your hands and clothes). Do not plant the tree too close to your house as they can get pretty big. A tree falling on your house can be costly in several ways. It does provide nice shade that you can put some lawn chairs or a picnic table under. Or an old-fashioned swing. If you get tired of your tree, you can cut it down & use the wood yourself. It makes beautiful furniture, but the wood is a hard wood that is more difficult to work with than softer woods like pine. If you just want a nut tree, I’d recommend a pecan tree instead. My parents had a pecan tree that provided us with enough pecans to eat year after year for 20 years. They had planted it too close to the house & had it taken down. It was sorely missed by all. 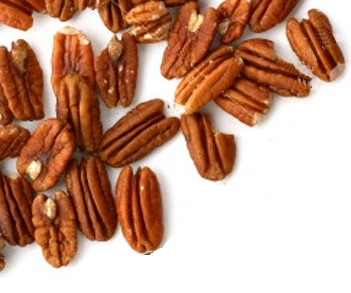 With pecans, you don’t have the stains of the walnut cover to deal with. They are also a lot easier to open. The green cover of the pecan shells dry and open on the tree (see photo above) allowing the pecan nuts in their shells to fall to the ground ready to pick up. Walnut shells are so hard that it takes a hammer to open them. And then you’ll need a nut pick to work out the nut meats. With pecans the shells are easy to crack and pecans often come out as halves. So much easier! We used to crack pecans on winter evenings while watching tv. They went into the freezer in glass jars until needed. No fuss and lots of good pecans. When she made cookies she no longer measured the pecans, but just threw them in by the handful. Now that’s a lot of free food! Mmmm . . . pecan pie, sugar-spice pecans as gifts, pecans in cookies, pecans on salads, pecans in wild rice, pecans in caramel syrup on ice cream. Somebody stop me. 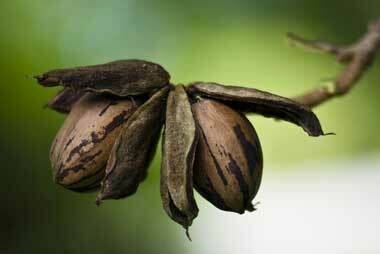 The bottom line: growing a nut tree provides you with cheap, healthy food. Just don’t expect to cash in on the wood unless you have suitable land in the country. 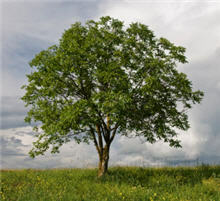 Here are the nitty-gritty facts about growing walnut trees for profit from OhioStateUniversity. Here’s an article at Business Insider about this money-making opportunity. Mrs. 1500, you were wise to wear the gloves! My parents loved the flavor of black walnuts and I did too. We used to take a drive in the autumn to some of their favorite black walnut trees in a park. We’d pick up the walnuts with old gloves and Dad would clean them up before hammering them. Black walnuts have a stronger flavor, as you know, than regular walnuts, but we liked it. We loved them mixed into vanilla ice cream. Yum. I lived next door to a black walnut tree. They did indeed provide the free nuts for me, all I had to do was pick them up off the ground. I had special gloves for this, because they stain everything, and make your fingers look as though you have a disease. If you want the free nuts without the fuss of having them grow in your yard, drive around in early fall and look at the ground in people’s yards. Anyone with lots of light green balls under a tree most likely doesn’t want them and will gladly let you pick them for free. I like the idea of growing my own pecans, though. I will have to look into growing them in my area.